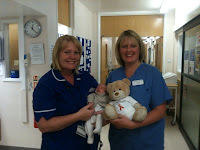 Tippi takes Nait bear to deliver a box of Krispy Kreme’s to the wonderful midwifes at the Leeds General Infirmary who looked after mummy for her 15 weeks of IVIG. Julie and Jenny get to meet Tippi after taking care of us all that time. A big thank you to everyone on Ward 57. Tippi Looks wonderful, and so does nait bear. Fantastic pictures, and such a sweet wonderful blog. I’m so proud of you, and all you have done.